The Malaria Program of the Ministry of Health organizes workshops after the conclusion of projects. With the successful completion of project for prevention and control of malaria and Zika in Suriname for an amount of $ 400,500 and a project for the prevention and control of non-communicable diseases, such as diabetes, hypertension and cancer in the amount of $ 500,000, has the Ministry of Health , in collaboration with the Inter-American Development Bank in Suriname (IDB), a Knowledge Sharing Workshop ‘organized on Tuesday, October 25th, 2016. During the workshop several presentations were held on the projects, the results achieved, the bottlenecks that were experienced during implementation and how the follow-range look. Both projects are successfully completed. Including through support of the IDB and the Global Fund as a major international donors, Malaria is almost eliminated in Suriname. 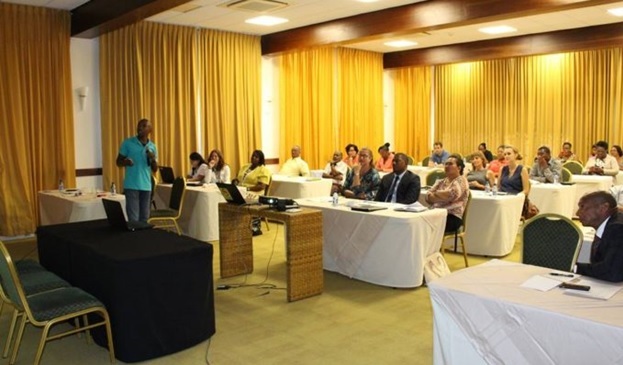 For non-communicable diseases have been developed with support from the IDB key strategies and guidelines, and successful and busy information campaigns were carried out, both in Paramaribo and in the districts. Health Minister Patrick Pengel, who participated actively during the workshop and also could make the conclusion, thanked everyone who contributed to the success of the projects.